Evergreens are the mainstay of the winter landscape. When the shade and flowering trees and shrubs of spring and summer have entered their winter sleep, it’s evergreens that take the stage. 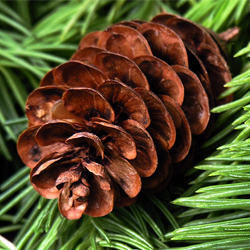 Spruce, cedar, pine, hemlock, arborvitae, yew and juniper – there are many beautiful varieties suitable for foundation or specimen planting, windbreaks, screens and groundcovers. Some change into their ‘winter wardrobe’ too: “Reingold” Arborvitae takes on a coppery hue, while junipers like “Bar Harbor” and “Prince of Wales” turn bronzy purple. Don’t forget broad-leaved evergreens for texture contrast, plus make use of evergreen perennials like Coral Bells (Heuchera), Thrift (Armeria), Creeping Phlox, Candytuft (Iberis) and varieties of Sedum for groundcover or edging. A few ornamental grasses such as Blue Fescue retain their color in winter and can create interesting and colorful tufts in a barren landscape. The foliage and flowers of others, like Miscanthus and Fountain Grass (Pennisetum), dry to a biscuit color and look particularly effective against a snowy backdrop. Berry-bearing plants are a boon for birds and other wildlife, as well as being a decorative addition to the winter landscape. 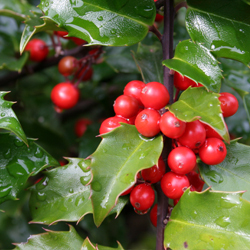 Try prickly Pyracantha, colorful cotoneaster and hardy hollies – a must for holiday decorating. Hollies come in many shapes and sizes for all sorts of landscaping situations. Plant a dwarf grower like “Blue Angel” (Ilex meserveae ‘Blue Angel’) as a foundation plant, a medium grower like “China Girl” (Ilex cornuta ‘China Girl’) as a screen or hedge and a tall grower like “Nellie Stevens” (Ilex) as a specimen. Hollies require a male pollinator for best berry production. Be sure and ask which pollinator you need for the variety you select. The beautiful bark which many trees and shrubs exhibit can be seen at its best during winter, when leaves have fallen and surrounding plants are bare. Paperbark Maple (Acer griseum) is a delightful small specimen tree with reddish-brown bark that exfoliates in thin papery sheets. 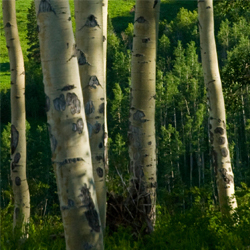 Consider white-barked European or Himalayan Birch or water-loving River Birch with its eye-catching grey-brown to cinnamon colored peeling bark. For attractive mottled trunks, plant Stewartia and Crepe Myrtle. The dazzling stems of Red and Yellow Twig Dogwood brighten as the winter progresses bringing cheer to dreary days. Twig Dogwoods look particularly stunning when planted in groupings in front of evergreen trees. Even in the middle of winter, there are a few plants that will surprise us with flowers. Perennial Christmas Rose (Helleborus niger) has pretty white buttercup-like flowers; its cousin, Lenten Rose (H. orientalis) blooms a little later with flowers ranging from purplish green to white and pink. Both are shade-loving and grow slowly to a loose evergreen clump. Witch Hazel (Hammamelis mollis) is a large, multi-stemmed shrub with fragrant late winter blooms in yellow, orange or red. Other late winter bloomers, all of which are also fragrant, include Leatherleaf Mahonia (Mahonia bealii), Wintersweet (Chimonanthus praecox) and Sweet Box (Sarcoccoca). Stop by soon and talk to us about planning your landscape to include background plantings, berries, bark and blooms for winter interest. Your yard will never have the winter doldrums again!